Thessaloniki is the second largest city of Greece and the capital of the Greek administrative region of Macedonia. It has a chequered history of Roman, Byzantine, and Ottoman structures, meaning opportunities for sightseeing Thessaloniki are plenty. Surprisingly, this unmissable destination is still something of a secret tip among holiday spots in Greece. Our guide will show you how to make the most of your visit to Thessaloniki, including top tips for what to see and do. And of course, there is also plenty of delicious Greek food to be eaten! In the year 1997 Thessaloniki earned the title European Capital of Culture from the European Union and in 2014 it was the European Youth Capital. The city sports several theatres, an opera and is seat for two symphony orchestras. With numerous festival and events taking place throughout the year, Thessaloniki is considered to be the cultural capital of Greece. So let us show you why we think that sightseeing Thessaloniki is a wonderful alternative to the now over-touristed attractions like Athens or Santorini. To help you to navigate, we created a directory for our Thessaloniki guide. Just click the link to the topic you want to read. Let’s be honest, Greek food is absolutely delicious, especially all the fresh-flavored ingredients like olives, feta cheese or ripe tomatoes. One of the best ways to experience the food culture in Thessaloniki is to go to a food market. You can either do this by yourself, or you can book a tour with a tour operator like Urban Adventures. We normally enjoy the organised food tours, as you can learn so much more with a good, local guide than by yourself. Also, there is a better chance of tasting a more diverse range of food! If you decide to visit a food market on your own, we can recommend a few good places. The Kapani (Vlali Market) is one of the most traditional markets in Thessaloniki. As well as food, you can also buy kitchen utensils and tourist souvenirs. The strategic position in the city centre and the low prices make it an attractive market for locals and tourists alike. The Modiano Market is the largest roofed market in Thessaloniki. You can find fresh fruit and vegetables, fish, meat, delicatessen, spices and other food products. If you’re tired of food shopping, then just sit down in one of the taverns there and have a cup of delicious Greek coffee. The Athonos Square is another important food market in Thessaloniki. Alongside the fresh and delicious produce, there are also a lot of traditional Greek tavernas in which you can get some delicious Greek food and hear live music. You want to know a bit more about the delicious local food of Thessaloniki? Then check out this amazing local food tour! Thessaloniki offers a variety of culinary specialties, many are just mouthwateringly good! Unlike the southern part of Greece, Thessaloniki still has a lot of influences left from the Ottoman empire. Because of this, the food has more Middle Eastern flavours than you may find elsewhere. This mix of eastern and western food influences make Thessaloniki a highlight for foodies. Some of our favourite dishes were deep fried zucchini, gyros (we recommend the Mpoukia Mpoukia restaurant, for us it was one of the best restaurants in Thessaloniki) and anything involving feta cheese and olives. If you want to know a bit more about the delicious street food of Thessaloniki Greece, you might find this post by Amber Charmei very interesting. Did you know that Thessaloniki has the highest proportion of cafes and bars per capita of any other city in Europe? This fact comes in very handy when you are looking for some protection of the hot summer sun. The coffee quality was generally very good when we visited for our Thessaloniki holidays, and the prices are relatively cheap. Culture Trip has a nice overview over the best Thessaloniki cafe’s if you are looking for some inspiration. If you want to have a drink with a sea view, you can visit one of the places on the seafront of the city. These places are quite a bit more expensive than the cafes and bars set further back and they are also located directly on the busy street that runs between. We found a place with the same views but much better value: The Boat Bar. You can take a short (about 35 mins) sea cruise on one of the three “party boats”. These boats leave regularly from right outside of the White Tower. You don’t have to pay to get on this Thessaloniki boat tour, but there is a bar on board so you are expected to buy a drink to cover the costs of running the cruises. We did the tour at sunset which offered us some beautiful views of the sea and the whole seafront of Thessaloniki. It’s definitely a must do for your Thessaloniki sightseeing if you enjoy scenic views! The White Tower is probably the most recognisable building in Thessaloniki. It is the emblem of the city, emblazoned on most of the souvenirs. This mighty tower was built in the early Ottoman empire. It is six stories high, overlooking the sea and was used to defend the city of Thessaloniki against maritime invaders. During the centuries it had many different names like “The Lion Tower” or “Tower of Blood”. The current name “The White Tower” exists since the tower was whitewashed as a symbol of cleansing when Thessaloniki was annexed to the Hellenic state in 1912. On the inside of the White tower is a museum describing the history of Thessaloniki. We paid €4 admission fee but there is a combined ticket. You can check out the prices on the official page. Depending on how well you understand Greek, we would recommend also paying the few extra euros for the audio tour, as all of the reading panels are in Greek. There are some great photo opportunities of the city and the seafront at the top though. This is definitely one of the best Thessaloniki attractions. In the 4th century, the Roman Emperor Galerius ordered the building of these two structures as part of his palace in Thessaloniki. The Rotunda Roman Temple was built in 306 A.D. which makes it one of the oldest religious buildings in Thessaloniki. Our blogger friends from Zest In A Tote wrote a great post for a 10-day Greece itinerary with kids, check it out! Archeologists believe that the Rotunda was used as a Roman temple. Its walls are 6 metres thick, which explains why it survived all of Thessaloniki’s earthquakes in the past. After the temple stood empty for some years, Emperor Constantine I converted it into a Christian church. Some historians say that it might well be one of the oldest Christian churches in the world, although it’s not the only Christian church with this claim. The arch is dedicated to Emperor Galerius for his win over the Sassanid Persians. The sculptures on the arch are stunningly beautiful and well worth closer observation. The Arch of Galerius and Rotunda are a UNESCO world heritage site. Another UNESCO world heritage site and one of the oldest churches of Thessaloniki is the Hagia Sophia. It was built in the 8th century, but before that, there was already another church standing there. The inspiration for this church was the Hagia Sophia in Constantinople, which is now modern-day Istanbul in Turkey. For 82 years, during the time when Thessaloniki was part of the Ottoman empire, it was converted to a mosque. The Hagia Sophia Thessaloniki is a domed Greek cross basilica, a typical architectural example of the Byzantine middle period. Before the Great Fire of 1917, Thessaloniki didn’t have any big squares. By this time, it was considered a lack of European architecture. Because of this, in 1918 the French architect Ernest Hébrard designed Aristotelous Square with an axis up to the Roman forum of Thessaloniki. Most of the buildings were only built later in 1950, and because of the financial situation of Greece, the original plans had to be simplified. It is still a stunning display of Hellenic architecture. These days, the Aristotelous Square is of huge importance for Thessaloniki and Greece as a whole. Many political speeches and large rallies have been organised at this place. The square is also an important event place for festivals and celebrations, for example, the Lent Carnival and Christmas. The many bars and cafes in the Aristotelous Square furthermore make it very attractive for younger people and the Thessaloniki nightlife. You could say it is the heart of Thessaloniki and it’s almost impossible not to see it when you visit Thessaloniki. The Heptapyrgion, also called Yedi Kule, is a Byzantine and Ottoman era fortress in the north of Thessaloniki. While the name means “fortress of seven towers”, it actually has ten towers. Archeologists think that the whole fortress is named after the Yedikule fortress in Constantinople (Istanbul). Until the late 19th century it was used as a redoubt and the seat of the garrison commander in Ottoman times. Afterward, it was used as a prison until 1989. These days its main purpose is to serve as one of the great Thessaloniki sights. The port of Thessaloniki is one of the biggest in the Aegean Sea. More than 3’000 vessels arrive in a year and as a free port, it is also very important as an entrance to the Balkan hinterland and southeastern Europe. At the eastern border of the port, you can find some interesting places to visit in Thessaloniki, for example, the Thessaloniki Museum for Photography, or the Contemporary Art Centre of Thessaloniki. Or, you could do it like we did. Grab a drink for takeaway at the little restaurant called “next” and watch the beautiful sunset from the pier over the whole seafront of Thessaloniki. Thessaloniki is not called the capital of culture without a reason. Because of the rich history of the city, you can find a lot of different museums which cover the different epochs. Two of the most popular museums are the Archaeological Museum of Thessaloniki and the Museum of Byzantine Culture. While the first one exhibits artefacts from the Archaic, Classical, Hellenistic and Roman periods, the second one covers mainly the Byzantine period and aspects. If you’re interested in museums, you can get more informations on Enjoythessaloniki.com. One of the things we personally really enjoyed about the second city of Greece is the street art of Thessaloniki. Some artists have created huge murals on the sides of buildings that really left us in awe. It’s amazing that, even against the backdrop of old churches and other historical buildings, they somehow fit well in this cultural capital of Greece. It’s a fantastic sight to see the modern paintings, with sometimes quite political statements, in contrast to porous walls. But it’s not only the huge murals which make the street art of Thessaloniki. It’s also the small tags on the walls, the decorations on the floor and so much more. The street art scene in Thessaloniki is big. In fact, it is so big, that they even have a dedicated festival to show the public what street art really is all about. It’s called SAF Thessaloniki (Street Art Festival) and it takes place every year. In 2016 this festival was held for the fourth time, and although we were too late to attend it by the time we visited, it is something we would definitely consider timing a trip around it if we come back to Thessaloniki in future years. During our time in Thessaloniki in 2016, we saw a lot of free range cats (according to Sarah, the correct term is stray cats but I think free range just sounds nicer). We saw cats of all kind of colours and sizes, but it would have been impossible to even make a guess how many there actually were. We found them under cars, on top of cars, on ruins, between ruins, on the pavement, at the harbour, in front of shops and fish stands, in narrow alleyways, in the middle of big motorways… literally everywhere where you could stand on four furry paws. She’s so cute, isn’t she? The reason why there is such an abundance of cats in Thessaloniki city is actually a very simple one. Greek people, unlike people from urban areas of northern Europe or north America, regard cats more as wild animals than pets. This leads to an uncontrolled increase in the cat population as nobody is neutering them. A lack of harsh winters and relatively easy access to food makes it easy for them to survive outdoors. Their greatest problems are cars and dogs. These street cats tend to “adopt” one or several houses (sometimes even whole neighbourhoods) that welcome them and provide them with food. They will mark it as their territory and defend it against other intruding cats, the same as a domestic cat marks its own turf. The people of Thessaloniki like their cats as they help to decrease the population of mice, and even scorpions and snakes. Organised animal welfare charities are not a big thing, but every now and then we saw individual people who brought food directly to the cats or put food-bowls out in front of their doors. There are several multiplex cinemas and loads of shopping malls in Thessaloniki. Passionate shoppers might find great stuff in the two major shopping streets of Tsimiski Street and Proxenou Koromila avenue. Those two streets are some of Greece’s most exclusive and expensive high streets. If you are more of a gambling person, you can try your luck in Greece’s biggest casino Hyatt Regency Casino and Hotel, which is also one of the biggest casinos in Europe. However, we do not recommend gambling with money you can not afford to lose! As there isn’t a Thessaloniki beach itself, you have to venture out a bit for some beach time. A perfect place to do this is Perea, one of the places to visit near Thessaloniki. By car it’s an about 30-40 minute drive to get to this cosy town at the sea. A nicer and cheaper, but slower way to do it, is to take a Thessaloniki boat trip across the bay for about 3 Euro per person. The ride will take about 50 minutes and is very relaxing. In Perea itself are some very clean beaches without currents or any big waves. This makes it perfect for swimming or paddling in the sea. There are a lot of good restaurants along the beach and you will not struggle to find good food or just a cold drink. Our recommendation is to mainly eat Greek food, as we had the experience that other European cuisines tend not to be so good. Go for fish, lamb, and grilled vegetables instead and you’ll be drooling by the time your plates are delivered to your table! If you fancy staying a bit longer at the beach you can rent a room in one of the hotels in Perea. We stayed twice in the Golden Star Hotel and were very happy with it. Another good alternative to get more beach time is, of course, some Island Hopping in Greece. If you want to escape the summer heat and are looking for some wet fun, then we can highly recommend you to go to Waterland as one of the day trips from Thessaloniki. This big water park is a little dated, but it is good fun and especially with kids, it’s a great day out. We have to admit that we went there just because sometimes it’s just great to feel like a kid again. It’s easy to get there as well, as there is a Thessaloniki bus driving to the Waterland. If you are interested in visiting this cool water park, then you can find some more information on their official webpage. Sightseeing Thessaloniki is definitely worth your time. No matter whether you’re interested in food, history, culture, beaches, fun or adventures, there is something to do and see for everyone in Greece’s second city. We think it’s a great alternative to a typical Greek island holiday. It is still relatively undertouristed especially compared to the hotspots of Athens and Santorini, but it may not stay that way forever. It is also a fantastic stop for when you tour Europe in a campervan, as you don’t have to ship over to an island but still has the best Greece has to offer. The hottest three months in the year are from June to August with daily temperatures of about 29-33C. We recommend to visit this great city in the shoulder season months May and September when the daily temperatures are more around 24-27C. 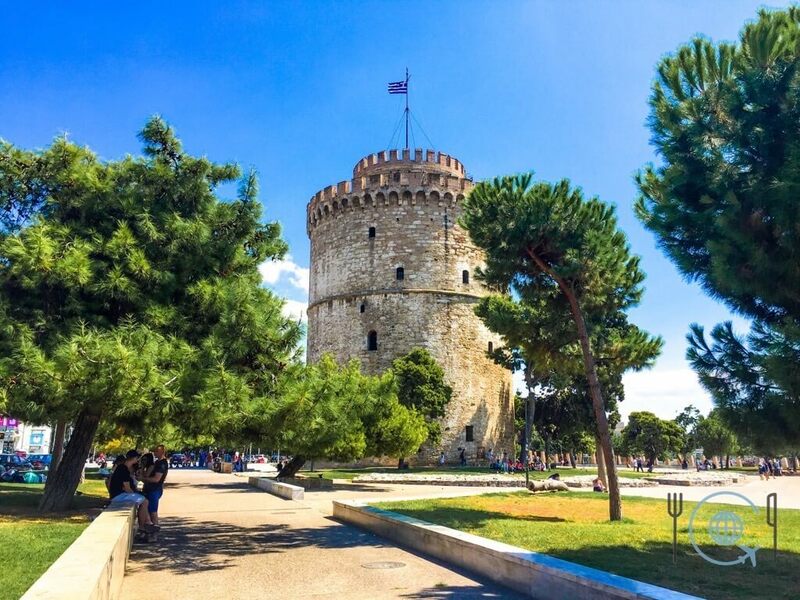 We hope we gave you some helpful inspiration with our Thessaloniki travel guide! If you’re looking for places to stay in Thessaloniki then check out booking.com. You can find some good deals for your Thessaloniki hotel there, including hotels on the beach in Perea. Have you already been on a Thessaloniki trip? Did we forget a great sightseeing Thessaloniki attraction? Then don’t hesitate to let us know in the comments below.